With the increased demand in electric-hybrid vehicles, the electromechanical designs of in-vehicle systems are becoming more sophisticated and there has been a demand shift to high efficiency brushless direct current motor (BLDC) implementation. Think of motorized seat adjustment, electric window, power steering, HVAC fans, pumps, etc. In many of these systems, various types of motors are used as actuators. BLDC motors use electric switches for current commutation, and thus continuously rotate the motor. The rotor includes two or more permanent magnets that generate a DC magnetic field. The magnetic field enters the stator core and interacts with currents flowing within the windings to produce a torque interaction between the rotor and stator. As the rotor rotates, it is necessary for the magnitude and polarity of the stator currents to be continuously varied by an inverter so that the torque remains constant and the conversion of electrical to mechanical energy is optimally efficient. For three-phase BLDC motors, a three-phase bridge structure (inverter) is commonly used as shown in Figure 1. In order to easily and efficiently limit the start-up current, control speed and torque, pulse-width modulation (PWM) is applied to some or all switches. By changing the switching frequency for the inverter, the motor behavior and performance can be influenced. Increasing the switching frequency will also increase PWM losses, whereas lowering the switching frequency will limit the system’s bandwidth and can damage or shut down the BLDC motor driver. Depending on the development goal and the set requirements, tests need to be performed on single components (e.g. inverter), sub-systems (e.g. motor including electronics) and/or systems (e.g. electric windows). Other motor-driven automotive systems include airflow, braking, adaptive headlights, power mirrors, instrument clusters, power locks, and more. A common instrument for these tests is the oscilloscope available to almost all engineers. It is a known product that is easy to use and provides two, four or even eight channels to solve a variety of measurement challenges. Using an oscilloscope, however, also presents a different set of difficulties. To connect to the high voltage signals coming from the inverter, channel isolation or differential probes are often required. The vertical resolution and effective accuracy (noise reduction and stability) can be insufficient for precise electrical measurements. Additionally, physical sensor measurements such as speed, torque, and vibration will also require external signal conditioning to provide precise measurements. Adding a second oscilloscope could be considered, however this will not solve the before mentioned issues of channel isolation and signal conditioning and can be a costly solution. In fact, adding a second oscilloscope will add another level of complexity to the entire measurement setup and post- measurement data processing. Port fuel injection systems are a robust and widely-used system for internal combustion engines. As a low-pressure system, port fuel injection has a simple method of injection control, resulting in less complex requirements as needed in high-pressure direct injection system. Using computer controlled electric injectors, fuel is sprayed into the intake manifold where it mixes with incoming air. The injectors mounted on the injector rail will constantly meter the required fuel volume into the air flow in such a way to ensure the engine’s fuel requirements are covered at all times, even at full load and high speeds. 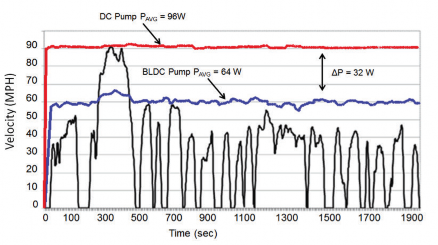 In order to maximize the efficiency of the fuel system, two fuel pumps designs were compared for fuel economy: on- demand BLDC vs. 100% driven DC motor fuel pump. 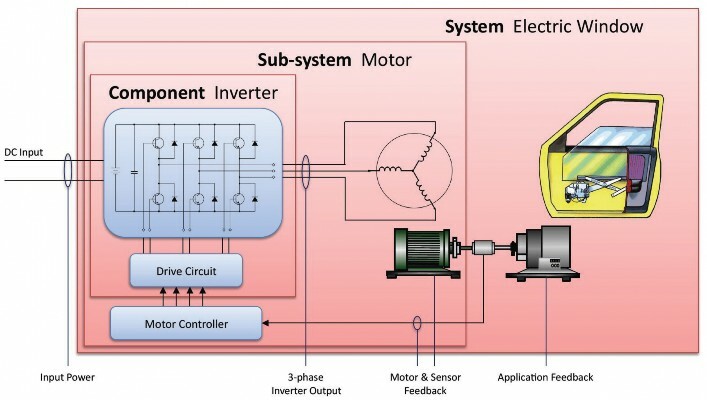 The schematic for these two system designs is shown in Figure 2. Utilizing the driving cycle speed profile of a six-speed automotive transmission passenger vehicle as the baseline model, the total power from all forces acting on the vehicle was calculated using Equation 1. Four test cycles were performed during the 30-minute driving cycle profile: stop- start (<1mph), coasting (<15mph), coast (<100mph), and regenerative braking. The velocity profile from the baseline model was used to simulate a load on the fuel system. For an accurate comparison between the performances of the two fuel pumps, the measuring instrument would need to be connected to all test points positioned across the input and output of each sensor and control driver. This would enable all signals (PWM and DC voltage, current, power, efficiency, vibration, pressure, torque, rpm) to be captured in real- time, so that precise data and time information could be synchronized with driving events. In addition to recording all sensor data for 30 minutes, scope triggers would be required to capture specific simulated events, such as pressure faults and voltage drops. instrument as shown in Figure 3. Its modular design allows for a combination of 19 different input module types with built-in signal conditioning and up to 1000V electrical isolation. Each channel can be specifically customized to the various test points in BLDC motor testing. Using the ScopeCorder, the average power consumption of each fuel pump system was charted against the speed profile as shown in Figure 4. The resulting data proved that an on-demand BLDC fuel pump system was 37.5% more efficient when compared to a 100% DC driven fuel pump system. The benefits of using a ScopeCorder can even extend to cost savings in accessories, as differential probes and (custom) signal conditioning electronics are no longer necessary. Engineers can start measuring signals immediately after taking it out of the box. And because all measurement channels are integrated into a single instrument, there is no need for external synchronization. This same instrument also features a wide range of math analysis functions that can be used in your measurement application such as PWM demodulation, three-phase and split-phase power, angle of rotation, harmonics, and more. In addition, the experience with oscilloscope user interfaces and their way of working will translate easily to the ScopeCorder considering its oscilloscope-based user interface. A ScopeCorder is a 2-in-1, mixed signal oscilloscope and portable data acquisition recorder built into one easy-to-use instrument. Using flexible modular inputs, it combines the measurements of electrical and physical signals in real time including voltage, temperature, strain, vibration/acceleration, CAN, LIN, and SENT serial buses. Designed to never miss a signal, it can capture and analyze both short-term transient events at speeds up to 100MS/sec and long-term trends for period up to 200 days. Will it suit your application? Still don’t believe us? Let us demonstrate its capabilities while measuring on your signals! Request your free on-site demonstration.